James Aveil Torque Enthusiast. Everyone knows classic Mercedes cars are pleasing to the eye, but did you know they can comfortably accommodate American muscle? 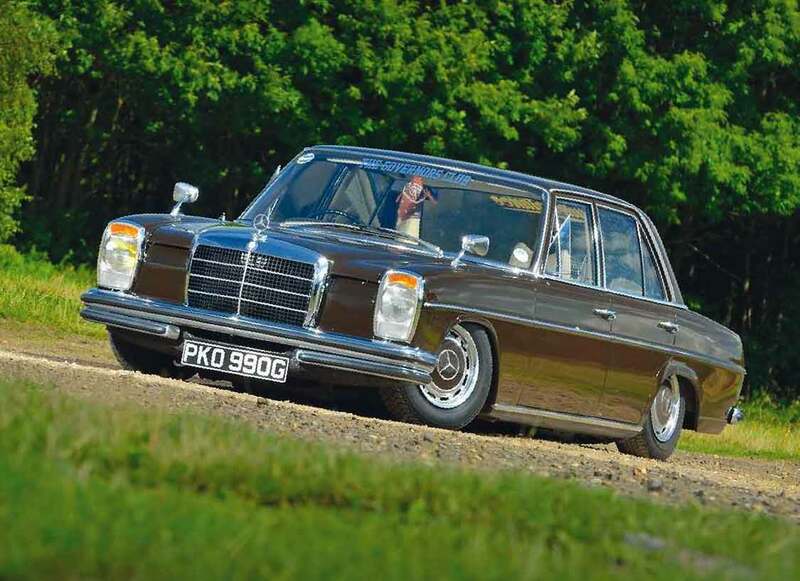 Old Mercedes saloons look great and can be bought at a low price due to the high number of four-door models produced in huge volume over the years. This is great news for those of us who want to drive a stylish retro ride, but find ourselves having to work to a tight budget. The trade-off is performance, where foot-to-the-floor action doesn't always deliver enough poke to keep up with modern traffic, but with a bit of clever thinking, even slow saloons wearing the three-pointed star can be given a new lease of life. My 1969 Mercedes-Benz 250 W114 is a good example of a Mercedes with pedestrian pace being afforded fresh energy. The car's engine bay is huge, a characteristic allowing me to consider a wide range of powerplants to swap with the M114 2.5-litre straight-six fitted at the factory. I love the idea of my German sedan running on American muscle, which is why the engine I've bought is a 4.5-litre V8 originally bolted to the front end of a Dodge Dart. I've trial-fitted the Mopar lump and its accompanying Torqueflight A904 four-speed automatic gearbox, and I'm delighted to report there's loads of room left for me to work at the nose of my car. I'll have to make custom engine mounts and I'll need to update the propshaft, but with the sport-profile camshaft, four-barrel carburettor and other parts I've acquired, I'm expecting a big increase in power which I intend to put to good use when travelling across the country to the various shows my car attends each summer. It's not just engine and transmission swaps made easy by the availability of space around the car's mechanical components. There's so much emptiness at each corner, I've been able to fit a custom air ride suspension system utilising Firestone double-bellow bags linked to twin Viair compressors and a four-gallon Air Lift Performance air tank. I've relocated the rear shock absorbers and added bespoke framework to support the alterations. There's plenty of room to play with. Put it this way, I certainly haven't had to shoehorn any of this third-party equipment into place! For modifiers like myself, Mercedes saloons built in the 1960s and 1970s are fantastic platforms to use for restomod projects. A friend of mine owns a BMW E30, and there's absolutely no way he'd be able to equip his Bimmer with my car's new engine and gearbox without a serious amount of fabrication work taking place. That's not to say a cheap old Merc isn't going to present problems. For want of a better example, my two-owner W114 needed sills, inner wheel arches and a nearside front floor pan after I brought it home on a low loader from where the seller lived. The brakes were seized through a lack of use, the engine was in need of attention and the bodywork required new paint, but a few weeks spent working on the driveway with my dad (the owner of a modified W114 280) saw my brown Benz spring back to life before I used it to hit the show season in style.